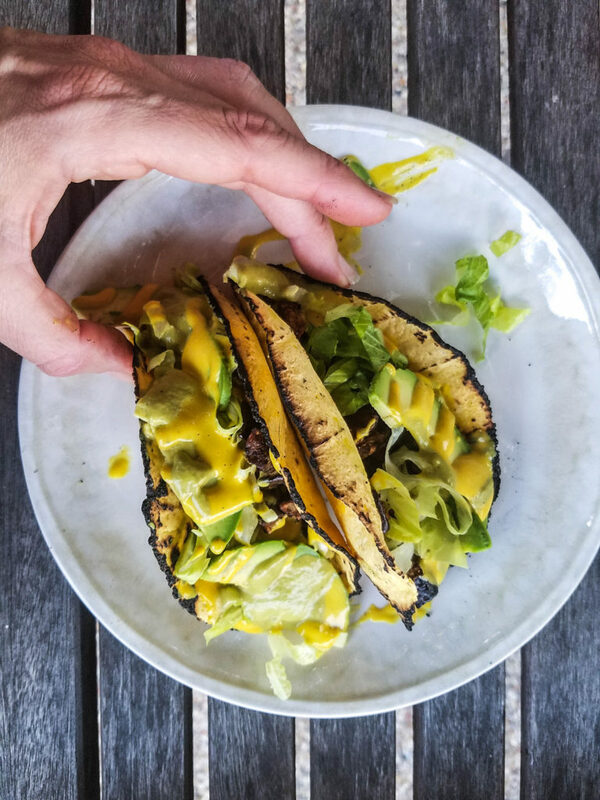 Fire charred tortillas are stuffed with smoky, roasted eggplant and topped with a creamy and spicy jalapeno sauce in these super satisfying plant based tacos that are so good you’ll never even miss the meat. Out of all the veggie tacos I make (and let me tell you there are quite a few) these are probably my favorite. The eggplant, tossed lightly in oil and spices then roasted until slightly sticky and caramelized, is so good even the hard-core meat eaters I’ve made this for end up loving it. Then there’s the sauce. THE. SAUCE. I’m pretty much a sauce fanatic and this one is at the top of my list. I call it Green Taco Truck Sauce because, although I’ve never had it from one, it reminds of the type of sauce you’d get from a really good, authentic taco truck. Simple, unassuming ingredients whipped into something with a wow factor of 10+. 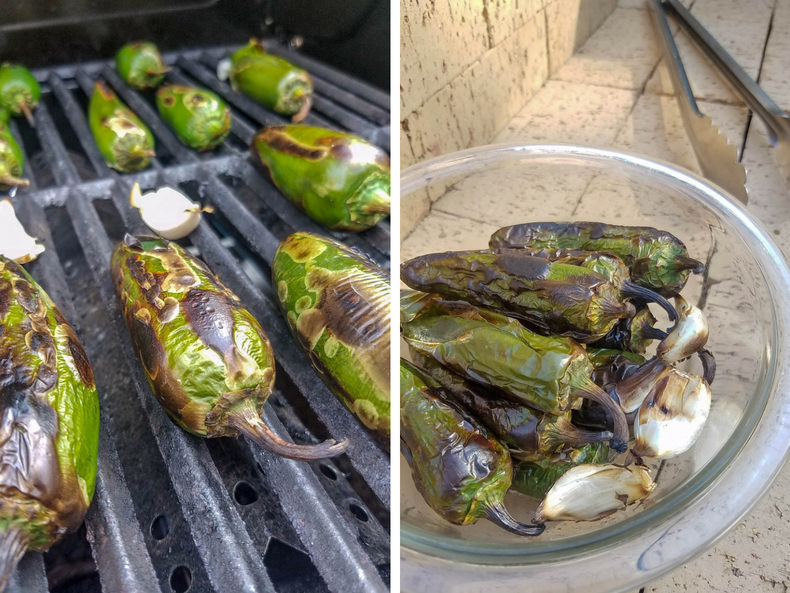 I’ve been making it for the past several years using roasted New Mexico green chile (from the half-ton we keep stocked in our freezer), but it wasn’t until last summer when, overrun by a bumper crop of jalapenos from our garden, I substituted the jalapenos for the green chile and, wow! What a difference. Both jalapenos and green chile can range from mild to hot depending on the batch you get and, while the jalapenos increased the heat slightly, it’s what they did to the flavor of this sauce that was the real surprise. I should probably explain that this decision to side with the jalapeno does not come lightly from me. As a native New Mexican, I am a die-hard green chile supporter. If you’ve spent any time in New Mexico you’ll know what I’m talking about, to say that New Mexicans like their green chile is like saying Bostonian’s like the Red Sox; a huge understatement. New Mexican’s worship green chile quite similarly to how Bostonians worship the Red Sox – religiously. So, when I made this discovery I actually went back and made the sauce again with the green chile, just to confirm that it was better with the jalapenos and yep, it was. I have some theories on why this may be, but it will take some more comparison batches to confirm (lucky me) so for now we’ll move on. The good news is this ingredient tweak makes it easier for people outside of New Mexico (the green chile capital of the world, BTW!) to make. 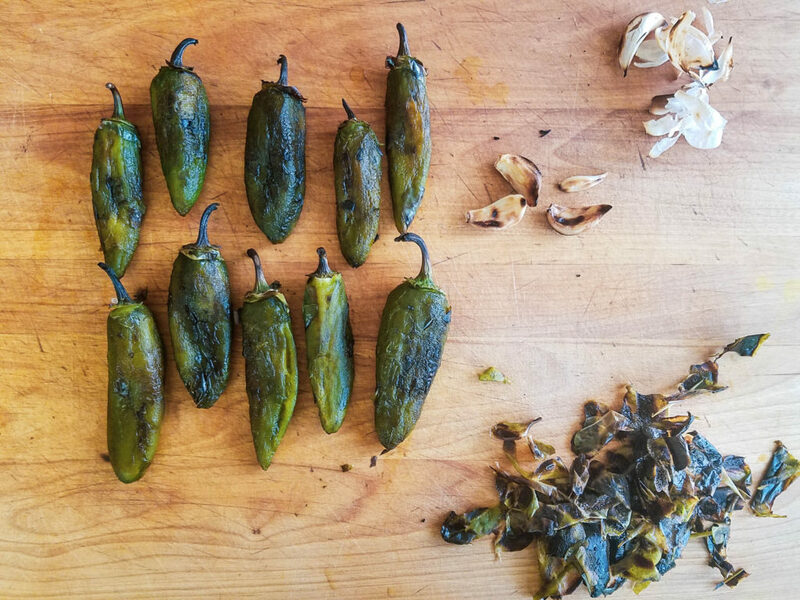 You can find jalapenos in markets and grocery stores pretty much everywhere but fresh or freshly roasted green chile is not as common. I have noticed green chile dishes popping up on some restaurant menu’s in recent years so maybe it will be more widely available in the near future. 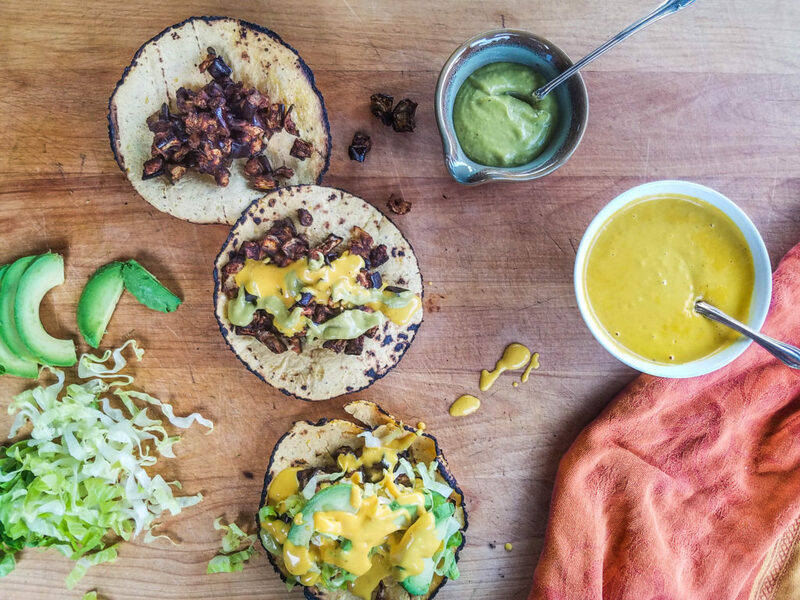 These tacos are easier than you’d think to prepare. Just chop up the eggplant, no peeling, toss it with some oil and spices and roast it. Put out a few accoutrements, warm up some tortillas and that’s it. 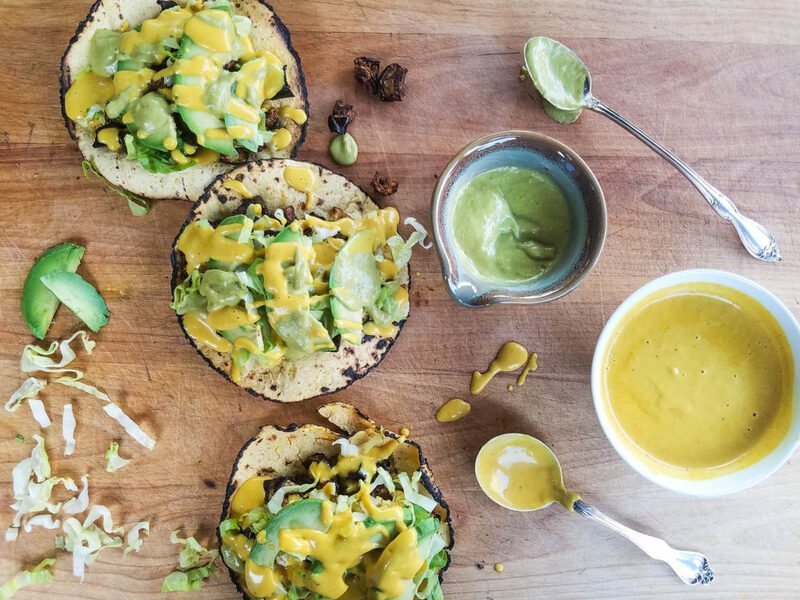 As I’ve said, my favorite sauce on these tacos is this Green Taco Truck Sauce but they are also great with this Cheese Sauce. 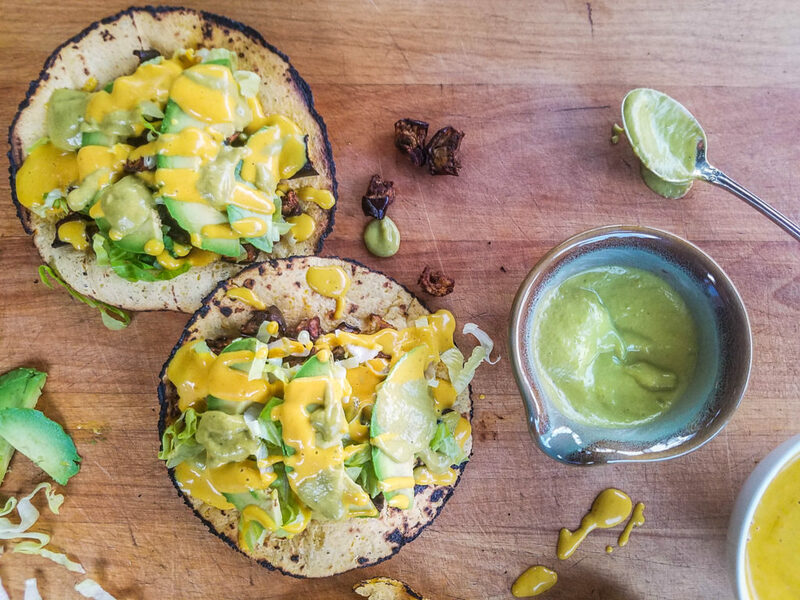 Personally I think these tacos are best with served with both sauces and if you’ve made one or both of them ahead of time this dinner comes together with little effort. 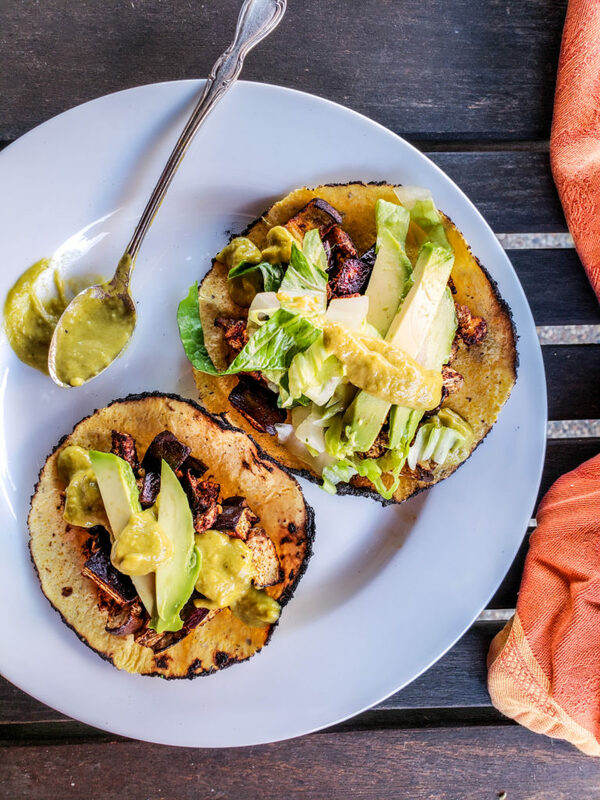 If, for some (strange) reason, you don’t want to make these eggplant tacos (you’re weird, I get it, no judgement…) I still strongly advise you to make the Green Taco Truck Sauce. It is seriously magic stuff and it’s great on a number of things ∼ eggs at breakfast, potatoes (sweet or otherwise) stuffed with your favorite fillings, even brisket tacos for you meat eaters. Depending on the size of your eggplants this will make enough for about 8 tacos. If you have leftover eggplant it is great the next day tossed in a bowl with quinoa, zucchini ribbons, romaine lettuce, avocado and a simple dressing made with lemon, garlic and olive oil. Mix the chile powders, cumin, garlic and salt in a small bowl. 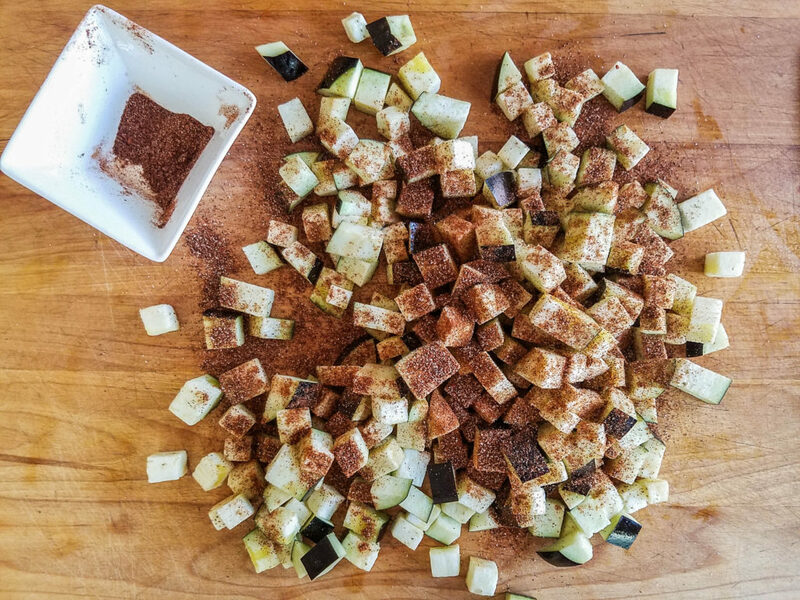 Wash the unpeeled eggplants and chop them into dice-sized cubes. Toss the chopped eggplant with the oil – you’ll need to do this quickly to evenly coat all the eggplant as it soaks up the oil like a sponge, I find using my hands works best. Sprinkle the spices over the eggplant and toss again to coat evenly. Divide the eggplant among 2 half-sheet pans lines with foil or parchment and spread in a single layer. Roast at 425 for about 25 minutes. Start checking the eggplant at 20 minutes to make sure it doesn’t burn. You want the larger cubes to be cooked through and the smaller ones to take on a bit of caramelization. 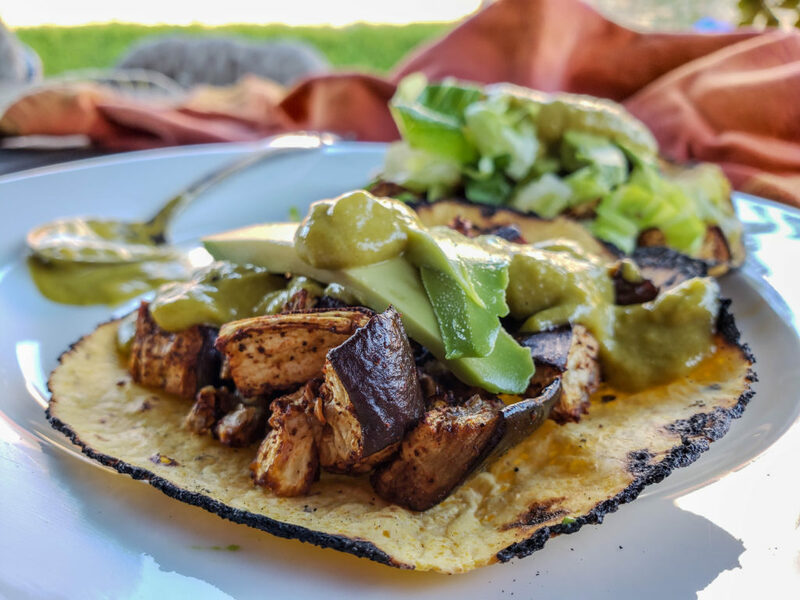 While the eggplant is cooking, warm the tortillas or char them slightly over an open flame and then keep warm. Once the eggplant is done, scrape it from the pan and serve with the tortillas and your toppings of choice. A little warning here ∼ the heat level on this sauce is dependent on the batch of peppers you get, if you don’t want to risk it being too hot take care to remove all of the seeds and veins inside the jalapeno when you’re peeling it. Heat a grill to medium high and grill the jalapenos and the garlic, turning every few minutes. Don’t let the garlic burn, it should only take 3-4 minutes for the skin to char, when it has remove it from the grill to a small bowl. Continue to grill the jalapenos until the skin is black and blistered on all sides, some will split or burst while cooking which is fine. Once done, place the jalapenos in the bowl with the garlic and cover to let them steam a few minutes. Once they’ve cooled enough to touch, peel the skin off the garlic and the jalapenos. As noted, if you want less heat remove some or all of the seeds and the inner veins. (The vein is the lighter colored stringy part that you’ll notice begins to come loose when you are removing the seeds). Place the jalapenos, garlic and salt into a blender jar with the smallest bottom and begin to puree, with the motor running, add the oil a little at a time. Once all the oil is incorporated continue to blend until you have a smooth sauce with a uniform color. Taste and add more salt if needed. This sauce keeps refrigerated for a week or so though it does tend to get hotter as it sits. Can’t wait to try those! !